Cartridge guns are designed for the application of pastes, gels, adhesives and most other assembly fluids. The G Series air guns are suitable for use with industrial 2.5oz, 6oz, 10oz, 12oz and 20oz size plastic cartridges and include an airline hose. 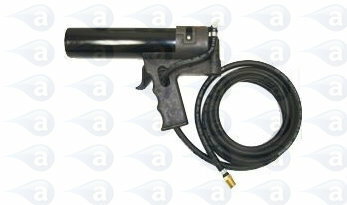 A high quality pneumatic cartridge gun with metal bayonet retainer and pistol grip. Suited to controlled lines or potting of most adhesives, fluids, sealants, RTV, grease, gels, long cure or single part epoxies, mastics and potting compounds. 6oz size (177cc approx). Includes a 10 ft long flexible airline hose. Attach a threaded nozzle or use a male luer lock adapter with any standard needle tips. Our series of metal retainers will work with this gun series. Optional metal retainer bodies are available to convert this gun to use different cartridge sizes 2.5oz (75cc), 6oz (177cc) and 12oz (355cc). Needle tip adapters can also be used with the cartridges for attachment of all standard precision tips. Guns are all covered by a 12 month warranty. Optional retainer bodies are available to convert this gun to use different cartridge sizes. This gun includes (1) gun, (1) cartridge, (1) plunger, (1) flange cap, (1) tip cap and (1) nozzle, (1) tip adapter and (1) tip. The guns are robust and handle most liquids and pastes dispensed from them. Items are shipped in the UK by a courier on a next day tracked and insured service for all items that are available from stock. Items on a lead time will be shipped as soon as they are made available. Warranty: All guns are covered by a 1 (One) Year manufacturers warranty against fault. Common Uses: Guns are compact and can be used in a factory production or maintenance area, in an assembly department as well as for repair and re-work. Guns are also commonly used in maintenance applications. Typical Applications:- Deposits of solder paste, Deposits of solder flux, Grease to bearings, Potting components with epoxy, RTV to edge seams, Silicone shots to bond products, Gasket sealant repair, Aircraft maintenance work, General adhesive applications.